By becoming a member of #TEAMLEO, receive a 5% discount on each of your eligible purchases. The more you spend, the more it pays for you! Ask our staff for your privilege card now. Make more points in a few clicks! The Leo Harley-Davidson Program offers a loyalty program to its customers! This program is called the #TEAMLEO Privilege Program (also called “Program” or “Privilege Program” in this document). By joining, you become a Privilege Member. The Privilege Program is not a credit card. The Privilege Program is a loyalty program that allows members of the program to earn points for every dollar, before taxes, of department, service, coin and store merchandise spent at Leo Harley-Davidson. These points can then be exchanged for parts, accessories, clothing or any other merchandise offered by Leo Harley-Davidson. Membership and participation in the program There is no charge for participation in the program. To join the program, simply go to Leo Harley-Davidson’s place of business and apply to join the Privilege Program. Membership in the Leo Harley-Davidson Privilege Program is individual and is not transferable to anyone other than the cardholder. No one other than the cardholder can accumulate or redeem points. Corporations, businesses or businesses are not eligible for the Leo Harley-Davidson Privilege Program unless specifically authorized by one of Leo Harley-Davidson’s executives at their sole discretion. Membership in the program is governed by the terms and conditions of this document, the use of the program constitutes acceptance of the terms of the program and any changes that may be made without notice. Use of the program also means your consent that Leo Harley-Davidson uses your personal information to refine the program and create preferred offers based on its members (see section “Confidentiality” for more details). Accumulation of points Leo Harley-Davidson Privilege Members earn points for each dollar of pre-tax in-store purchases of non-discounted merchandise from the Parts and Shop Departments for all payment methods, with the exception of a payment with rewards from the Privilege Program. In the event that a portion of the payment comes from the points accumulated with the Leo Harley-Davidson Privilege Program, the points accumulated for the transaction will be calculated from the portion of the payment that was made with the other payment methods that the rewards of the Léo Harley-Davidson Privilege Program. Points are earned on every dollar of eligible merchandise purchases at Leo Harley-Davidson. These points are not cumulative in the following situations: • Not applicable when buying a motorcycle or any other product from the sales and financing departments (examples: insurance, extended warranty, registrations, etc. .) • Can not be combined with any other promotion, discount or gift; • Not applicable on merchandise that has been modified by a subcontractor; • Not applicable on merchandise paid with accumulated points; • Not applicable on the purchase of merchandise to be ordered from another Harley-Davidson® retailer; • Not applicable on repairs made under warranty or paid by an insurance company. • Not applicable to the purchase of a gift card. 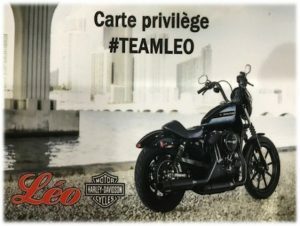 After 1 year without any transaction at Leo Harley-Davidson, the balance of points accumulated in the Leo Harley-Davidson Privilege Program will be transferred to a discount coupon that expires after 90 days, and this discount coupon will be sent to the Privilege Member who had accumulated these points . If the Privilege Member had registered his or her email address on file when joining the Privilege Program or thereafter, the discount coupon will be emailed to that email address. If he did not enter his email address, the rebate coupon will be mailed to the mailing address on file. If neither the email address nor the mailing address are on the file, the owner of the card will lose his points. The points accumulated on the initial purchases will be the equivalent of 5% of the eligible purchase made, until the cumulation of these purchases reaches 1500.00 $. No points are awarded when you purchase a gift card, however the user of the gift card will be able to accumulate.